Android phones come in assorted forms, and from various manufacturers. 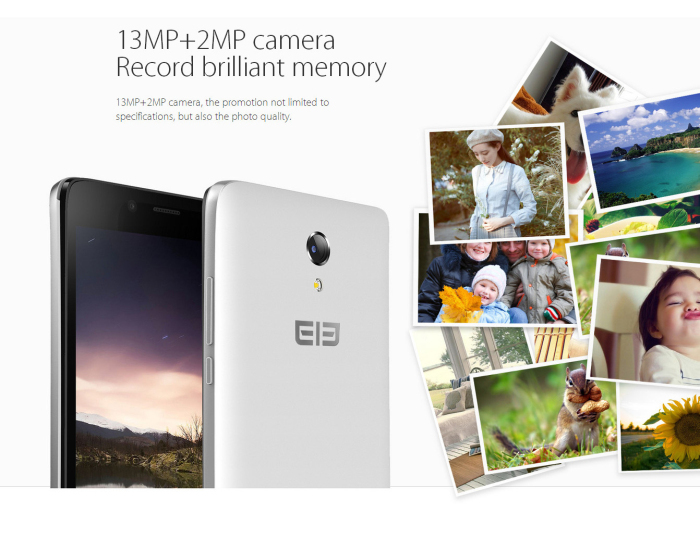 Finding and selecting a phone that suits you is not always easy, and looking to a lesser known brand like Elephone may be the right solution for the best balance in value and quality. 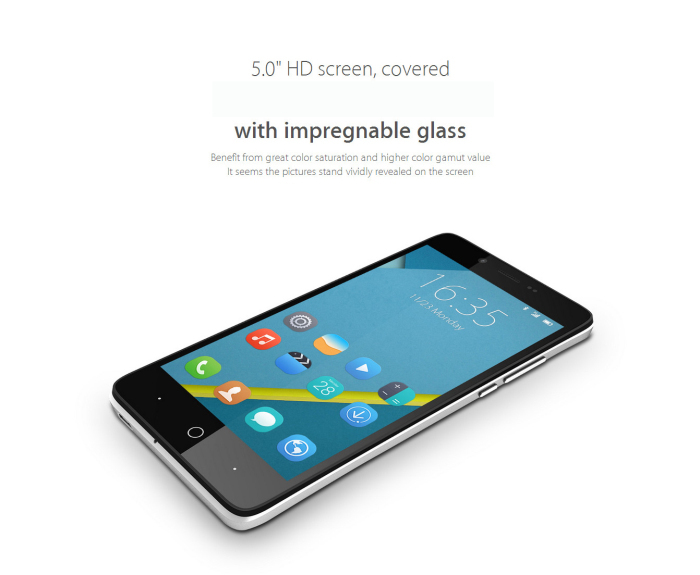 The name Elephone is not one generally associated with smartphones in the west, but this rapidly growing company has proven its ability to manufacture devices like the Elephone P6000. You can find this cellphone on Gearbest with free shipping, along with some other online retailers. Despite having an all plastic body, the Elephone P6000 has a solid build with a sturdy construction. While it isn't the thinnest phone out there, its 8.9mm thickness actually contributes toward its build quality, giving it a firm feel when it is handled. Its design is similar to most modern smartphones, but Elephone has added in rounded edges to make the phone feel comfortable in your hand. The removable back cover actually contributes to this curved feel of the phone, and power and volume buttons are built into the back casing on the right side of the phone. These buttons are easily accessible when the phone is held in your left hand. On the top you have a 3.5mm headphone jack, while the micro-USB port can be found on the bottom left of the device. The rear of the device shows off a prominent Elephone logo, the speaker grill, the flash and the camera lens. Personally I have never been a fan of having the speaker on the rear, as its usually muffled when placed on a desk. On the front you have a 5 inch 720p display, a front facing camera for video calls and a set of blue capacitive keys on the bottom. The home key glows when used, and also flashes when you have a notification. However, the back and menu keys don’t have a back light. The Elephone P6000 has a 5 inch IPS display with a 720 x 1280 pixel resolution, which calculates to 293 ppi. While full 1080p HD displays are common on some 5 inch devices, the P6000 performs adequately with 720p. The display used on the P6000 offers good color reproduction and viewing angles. 64-bit processors are quickly becoming a stable addition on Android smartphones, and the Elephone P6000 is ahead of the pack as one of the first smartphones from an Asian OEM outfitted with such a processor. 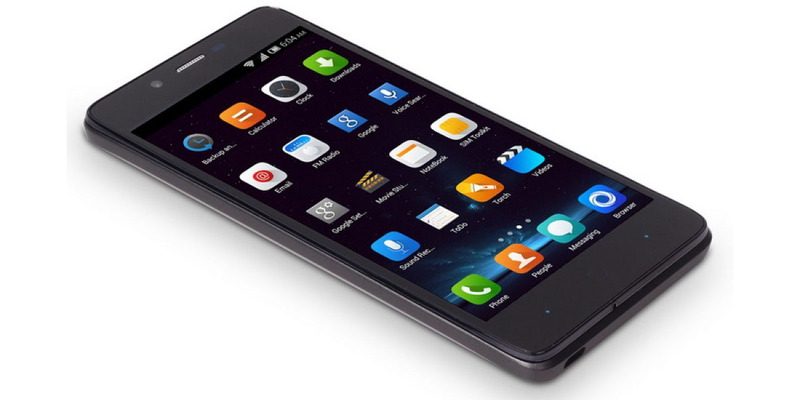 The handset has been outfitted with a 1.5GHz quad-core Cortex-A53 based MediaTek MT6732 processor. 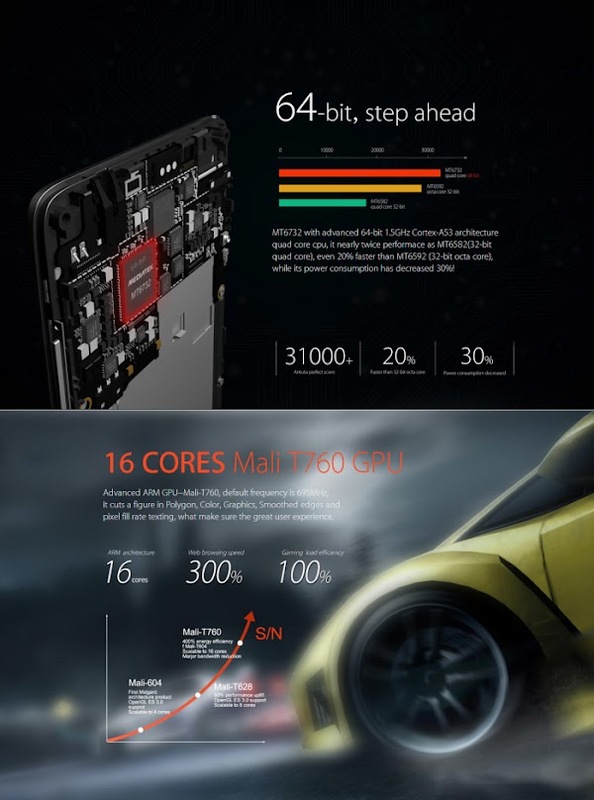 According to Elephone the MT6732 is 20 percent faster than MediaTek’s octa-core Cortex-A7 based processors, but with 30 percent less battery consumption. The setup also features a Mali-T760 GPU and 2GB of RAM, which when coupled with the processor should offer decent overall performance for a mid-ranger. 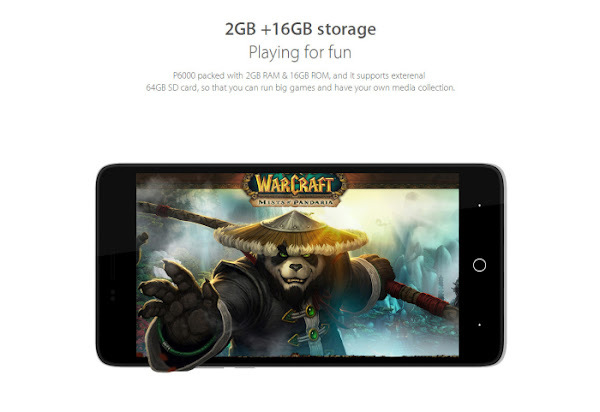 The Elephone P6000 has 16GB of internal storage, which is generally adequate for a modern smartphone. You should be able to store your music, photos and a reasonable number of apps without any issues. Additionally the handset also offers microSD storage, allowing your to add up to 64GB of additional storage should the need arise. The P6000 is outfitted with a 13 megapixel camera on its rear, and a secondary 2 megapixel camera in front for video calls. The inbuilt camera app includes features like HDR and Panorama, while users can change settings like exposure level, the scene type, the white balance, face detection and so on. The camera should cover all your basic needs, and should perform well as long as you have adequate light. Users can also download and use third-party camera apps from the Google Play Store if they need any. 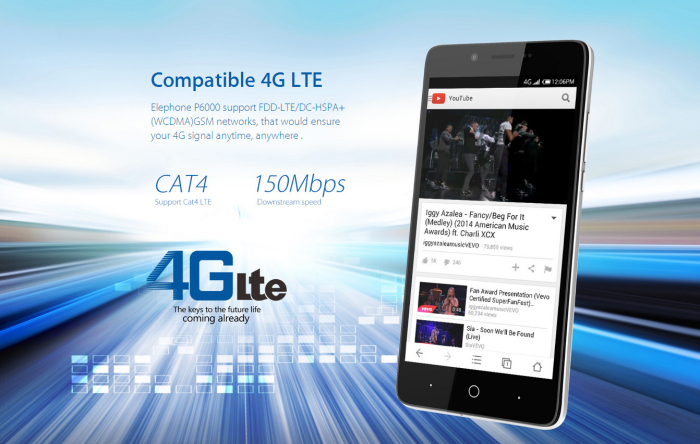 The P6000 is a dual SIM phone that offers quad-band GSM, which means 2G will work just about anywhere in the world; dual-band 3G, on 900 and 2100MHz; and quad-band 4G LTE on 800/1800/2100 and 2600MHz. Make sure to check if your carrier supports the bands you want before purchasing the device. The Elephone P6000 also comes with built in GPS, which you can use with Google Maps or HERE Maps which include turn-by-turn navigation. The handset comes with a 2700mAh Lithium-Polymer battery, which should offer a little over 14 hours of battery life with around 3 hours of screen on time. This should be enough to last the day, but we would have liked it to last a little longer, considering its power optimized processor and the use of a 720p screen instead of a higher resolution one. 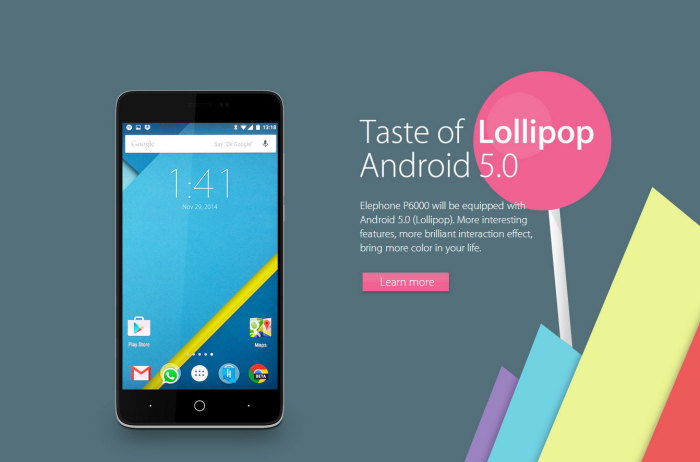 The Elephone P6000 runs Android 5.0 Lollipop, and has access to the Google Play Store along with all of Google's apps and services including GMail and YouTube.